Discover the hidden land of Japan’s origins. See and experience the beauty of this nature blessed land. You won't find over run temples or over populated metropolises here. This is where Japanese go to get away and get back to their roots. Hike along the coast and through mountain valleys and castle towns. Soak in the natural hot springs of Japan's most popular hot spring village, Kinosaki Onsen. Take a bay cruise past one of Japan's three most beautiful views, Amanohashidate to the fishing village of Ine nicknamed Japan's Sicily. There is also an abundant amount of outdoor activities, cultural workshops, and local delicacies to try. Come and discover the original Japan. Toyooka city welcomes 40,000 visitors annualy and those numbers are steadily growing. The main attractions being the nationally famous hot spring town of Kinosaki Onsen, one of Western Japan's top four ski resorts, Northern Hyogo prefecture's "little kyoto" and castle town Izushi. 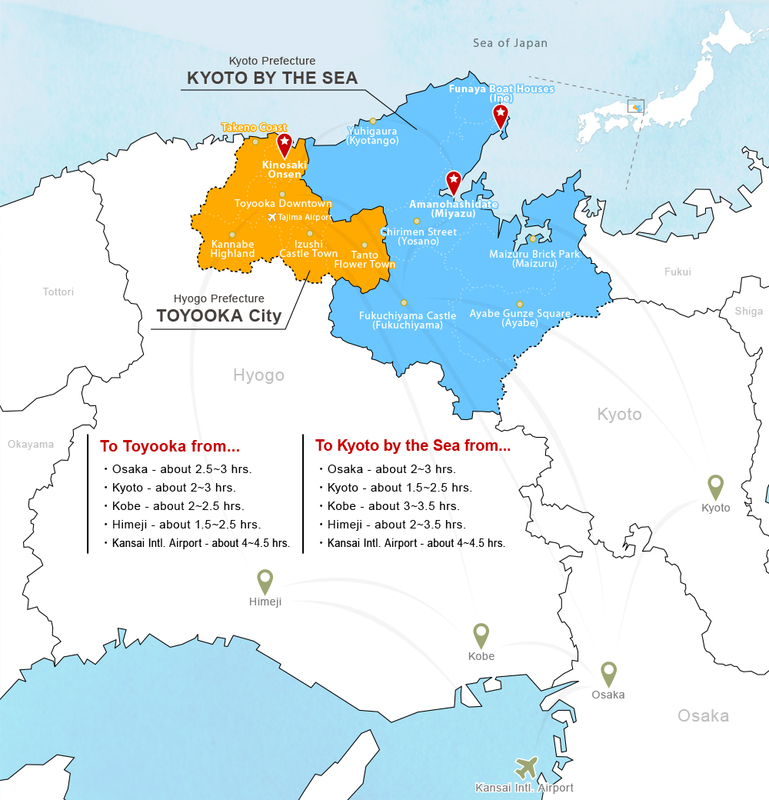 The city of Toyooka is also known as one of the four largest bag production centers in Japan, the bags made in Toyooka and that meet the bag industries standards are given the brand name "Toyooka Kaban". People from all over the globe gather here. Dressed in traditional Japanese attire yukata, they stroll through the hot spring town that is filled with ambience. An abundance of outdoor activities can be enjoyed here with sea, mountains and a river all in one area. The main river - Maruyama River quietly winds it way through the center of Toyooka City. Experience the excitement of nature year round in the Hidaka area with camping in the summer and skiing or snowboarding in the winter, plus more. "Kyoto by the Sea" is where civilization blossomed before any other region in Ancient Japan, as a result of culture from the Asian continent crossing the sea to this bountiful, nature-blessed land. That is, this is the origin of Japan. Visit "Kyoto by the Sea" and experience a yet-undiscovered Japan. "Amanohashidate", one of Japan’s three most famous scenic views, is a naturally-formed geographical feature that is narrow and long, with a total length of about 3.6 km. Legend has it that the god who created Japan used a ladder as a means of traveling back and forth between heaven and earth. One day, this ladder fell and became Amanohashidate. This spectacular and mystical landscape can be viewed from two observatories. The boat houses of Ine are constructed such that the first floor is a garage-like space for boats, with living quarters upstairs. The row of approx. 230 boat houses surrounding the waters of Ine Bay is a unique sight found nowhere else in the world. Red-bricked structures can be found throughout Maizuru, which developed as a port town in the modern age. In particular, the red-bricked warehouses at Maizuru Brick Park are brimming with retro charm and have also been designated an Important Cultural Property of Japan. Another highlight is the 5,300-year-old dugout canoe that was excavated in Maizuru and is considered one of the oldest in the world. Fukuchiyama Castle was built by the feudal warlord, "Akechi Mitsuhide". The three-layered, four-storied castle tower is beautiful in its practical design and presents a stately appearance. The stone walls created by ruggedly-stacked stone pagodas, in addition to natural rock, is also a sight to see. A fantastic spot for sunsets, the golden reflection on the sea surface just before sunset is known as "sun mirror". Take time out to sit on the bench and enjoy the sunset. Yuhigaura is also great for swimming in the summer. "Kyoto by the Sea" is the hometown of "Toyouke-no-okami", the God of Food and Textiles, and can also be considered the "Birthplace of Textiles". In the modern age, this region prospered as a major producer of "Tango Chirimen (a fabric imparted with an uneven surface by a special technique)" that is the silk fabric used in high-end Japanese kimonos. A townscape with the modern atmosphere of this period still remains at Chirimen Street, a perfect backdrop for a stroll in a rental kimono. At this spot, together with the nearby Gunze Memorial Hall (former Head Office of Gunze), buildings that are designated Heritage of Industrial Modernization convey the history and culture of the region, which prospered as a town of sericulture and silk reeling. Housed in four repurposed cocoon warehouses built in the 1910s, Gunze Museum features exhibits highlighting Gunze's technological advancements and more.